Recent archaeological discoveries on the Arabian Peninsula have uncovered evidence of a previously unknown civilisation based in the now arid areas in the middle of the desert. The artefacts unearthed are providing proof of a civilisation that flourished thousands of years ago and have renewed scientific interest in man and the evolution of his relationship with animals. 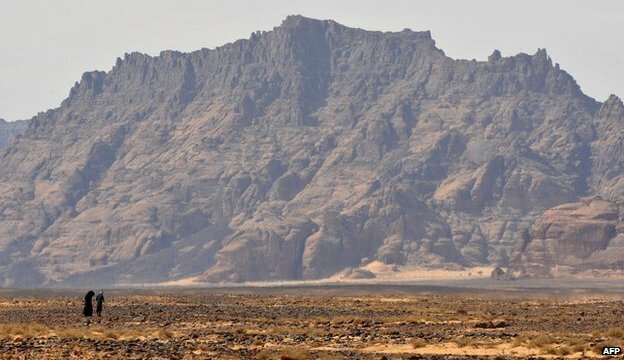 The 300-odd stone objects so far found in the remote Al Magar area of Saudi Arabia include traces of stone tools, arrow heads, small scrapers and various animal statues including sheep, goats and ostriches. But the object that has engendered the most intense interest from within the country and around the world is a large, stone carving of an "equid" - an animal belonging to the horse family. According to Ali bin Ibrahim Al Ghabban, vice-president of the Saudi Commission for Tourism and Antiquities, DNA and carbon-14 (radiocarbon) tests are continuing. But initial evidence suggests that the artefacts date back 9,000 years. "These discoveries reflect the importance of the site as a centre of civilisation," he told BBC News. "It could possibly be the birthplace of an advanced prehistoric civilisation that witnessed the domestication of animals, particularly the horse, for the first time during the Neolithic period." 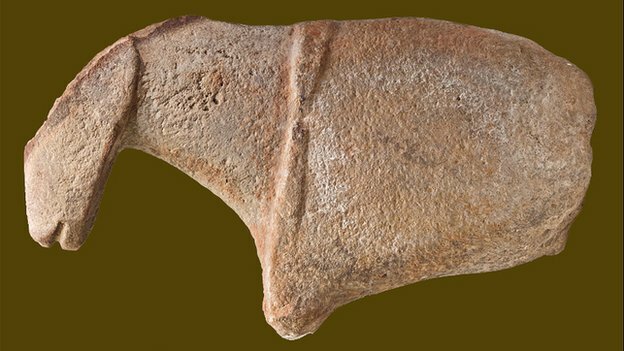 The crucial find is that of a large sculptural fragment that appears to show the head, muzzle, shoulder and withers of an animal that bears a distinct resemblance to a horse. The piece is unique in terms of its size, weighing more than 135kg. Moreover, further discoveries on the same site of smaller, horse-like sculptures, also with bands across their shoulders, have opened the possibility that an advanced civilisation here may already have been using the accessories of domestication - tack - in order to control horses. While archaeologists and other experts have held that horses were first tamed and exploited by man some 6,000 years ago in west Kazakhstan, experts are now starting to consider whether both location and date should be revised in light of these remarkable finds. Whether yoking man and animal together in this way is supported by evidence is one of the many questions that face an international scientific team brought together to examine the finds. Selected from a wide background of specialisations, their unique expertise is expected to paint a picture of life in the area during pre-historic times. Michael Petraglia, professor of human evolution and prehistory at the University of Oxford has been working on the radiocarbon dating at Al Magar. He says that the site dates back even further than first thought and can reveal much about the fluctuations between wet and dry periods in the Arabian Peninsula. He adds that the horse fragment dating links with the peninsula going through a wet phase. "This is a crucial piece of information about an area that is now hyper arid but in the past must have been a lush river valley," he explains. "It confirms that there were savannahs and grassland in the vicinity," he explains. Traces of other stone tools such as scrapers have been estimated as dating back more than 50,000 years. They were found at the site and suggest that Al Magar was a hospitable place for humans to settle in over thousands of years. In part this is due to its topography, or terrain. Michael Petraglia says that in the past, the spot must have been a lush river valley: "There is a major valley across the area which once was a river running westward forming waterfalls and taking water to the low fertile lands west of Al-Magar," he explains. "Al Magar was situated on both banks of the river. Man lived in this area before the last desertification or before the drastic climatic changes ended with the hot dry conditions and development of deserts." The name Al Magar means gathering or meeting place. Juris Zarins, who worked in the early days of archaeology in Saudi Arabia and found tethering stones dating back to the Neolithic period, claims that the site is within an archaeological hot bed. "There has not been enough exploration carried out," he says. "Discoveries like this could change things." And indeed the finds have had a huge impact, sparking intense interest in Arabia's prehistory. Other finds made beyond the large and well-preserved Al Magar dovetail with current Arabian passions. Of particular interest are canine remains that resemble one of the oldest known domesticated dog breeds, the desert saluki, as well as traces of a dagger. Abdullah Al Sharekh, an archaeologist at King Sa'ud University in Riyadh, and a pioneer of the Al Magar site, found statues within the precinct of a building. This, he says, may reveal vital clues about trade, migration and ritual. "The variety of the finds can tell us about social life and culture," he explains. "This will take time but all the evidence is here." The discovery of the large horse sculpture fragment has naturally awakened regional interest. This in turn has compounded curiosity about other important Arabian finds. 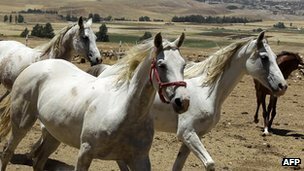 "It is an amazing discovery that raises all sorts of questions about when man stopped tracking down wild horses and began taming and exploiting them for transport," Mr Al Ghabban says. "On this site there are very important symbols of authentic Arabian culture - equestrianism, falconry, the saluki hunting dog and wearing of the dagger." More excavations are planned of yet other sites which have never been surveyed, and further studies are expected to unveil more important information on the Al Magar civilisation along with its impact on the history of Saudi Arabia.